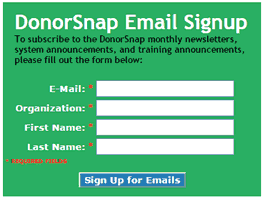 Email List Management -- Are you getting the most out of DonorSnap? Managing an email list probably isn't one of the most exciting parts of your week. It can take time, get messy quickly, and may even be scattered between several different systems. One of the ways that you can make the most of DonorSnap is by using it to track of all your email addresses and preferences. You will be able pair email preferences with donation/volunteer/event data, grant access to anyone who needs it, and segment your lists to send super targeted emails that will give you the best conversion rates. Think of one of your favorite supporters. You probably know a lot about that person including their general donation history, volunteer activities, when they last visited, etc. Let's say that last year when you started building a new playground for the after school program, they made a $10,000 donation in a heartbeat. This year when you need a new van to pick up the children and bring them to the building, are you going to ask that donor for $100? I hope not... If they were willing to make another $10,000 gift, but instead only gave $100 because of your generic ask, you would have missed out on $9,900! Zoom out to your entire donor database. What if you could craft your messages to be specific to each person in your database without individually writing each letter. By tracking your email list in DonorSnap, you can take all of your data into account. You will be able to segment your database into groups of people that have similar characteristics, that may respond in similar ways. In DonorSnap, the query tool called DataMiner Platinum will be your best friend. Check out these training videos for help. 2015 Donors who have the Attribute "Volunteer"
Donors who gave more than $99 but less than $1,000 in the past 12 months. Need help building a specific query? Contact the support team. Now that you know who you want to send your email to, you need a way actually create and deliver that email. DataMiner Platinum will let you download a spreadsheet of your targeted email list and you can then upload it into any email marketing system that you would like to use. If you want to skip the export/import steps, DonorSnap is integrated with Constant Contact, and it can send your list directly to Constant Contact. Want to give Constant Contact a try? Get started by going to http://donorsnap.constantcontact.com. Once you see how valuable list segmentation can be, you will probably want to make some modifications to your database so that you can track the data needed. This will typically include creating new user defined fields and dropdown options for existing fields. Fields such as Attributes, Volunteer Preferences, and Email Subscriptions can be set up as multiple select drop down fields. This type of field will keep your screens organized while building a comprehensive profile of your supporter. If your needs are very simple, a simple yes/no checkbox titled Email List might be all you want. Here's a short video that walks you through setting up user defined fields. The final piece of managing your email addresses and subscription preferences is to create one or more online forms to collect all your supporters' information. It could be a very short form that uses hidden fields to keep from overwhelming visitors (shown below), or you could add as many fields from your database that you want. In general, shorter forms are more likely to be filled out, so try using hidden fields when possible. If you track a date like Subscription Signup Date, mark it as hidden and then leave the default value blank. This will default the date to the day the form was submitted, and your visitor will not be bothered with it. If there is any other information that all visitors will have in common, set a default value and hide it from the form. Learn more about DonorSnap Online Forms in the Online Forms Overview Video. Want to learn more? Check out the training webinar recording: Best Practices for Managing Email Lists.